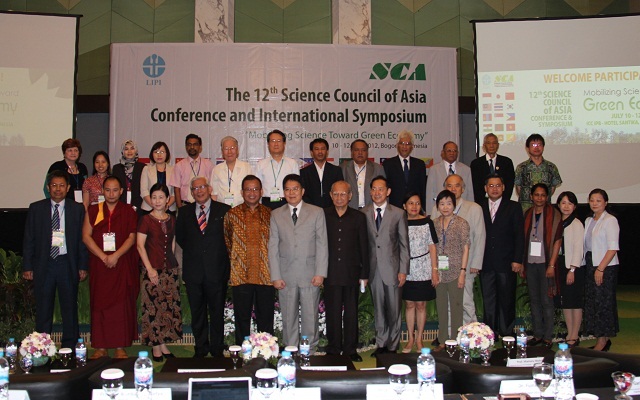 The 12th SCA Conference was held between 10 and 12 July, 2012 at Hotel Santika Bogor and IPB International Convention Center in Bogor, Indonesia. The conference was attended by eleven member countries including those of which obtained membership newly during the conference, namely, Cambodia, China, Indonesia, Japan, Korea, Malaysia, Myanmar, the Philippines, Sri Lanka, Thailand and Vietnam. 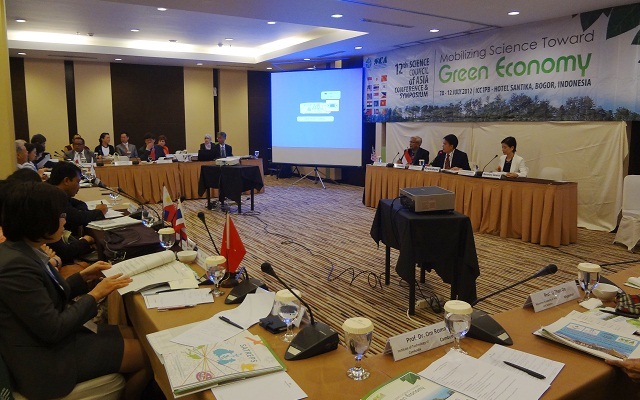 Between 11 and 12 July, SCA International Symposium "Mobilizing Science toward Green Economy" was organized by Indonesian Institute of Sciences (LIPI). The symposium was composed of a series of lectures, presentations, parallel sessions and panel discussions addressing the four sub-themes, namely, "Green Policy", "Food Safety/Security", "Green Technology" and "Eco Financing". It was attended by 232 participants from academia, government and public. Upon commencement, Professor Lukman Hakim, President of the SCA and H.E. Mr. Benyamin Lakitan, Deputy Minister for Science and Technology Institutional, State Ministry of Research and Technology delivered opening addresses. Following the opening addresses, Professor Emil Salim, a Former Government Minister of the Republic of Indonesia, gave a keynote lecture titled "Developing Green Economy in a Culture of Greed". 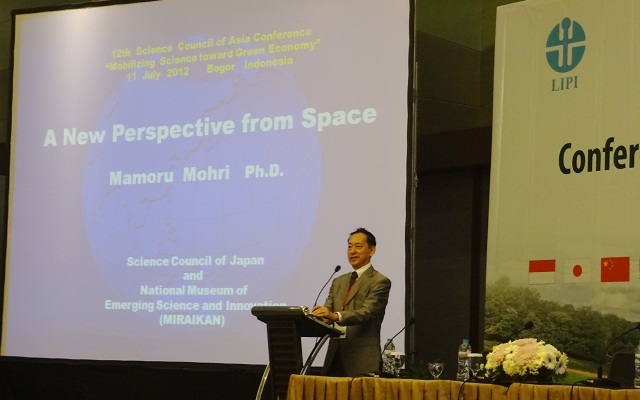 Dr. Mamoru Mohri, Astronaut/Chief Executive Director, National Museum of Emerging Science and Innovation of Japan, then presented a lecture titled "A New Perspective from Space". Also, Mr. Sonam Bumdhen, Director of Library and Research division at the Central Monastic Body of Bhutan, delivered a lecture titled "Finding Happiness in a Sea of Chaos: Perspectives from a Buddhist Monk". The keynote presentations stimulated the audience as they included not only the economic and technological dimensions of development, but also included the more abstract and spiritual dimension of human happiness. The symposium offered the total of thirty three oral presentations and thirty seven poster presentations focusing on each sub-theme. The presentations had been selected from respondents to call for papers by the Scientific Committee members. 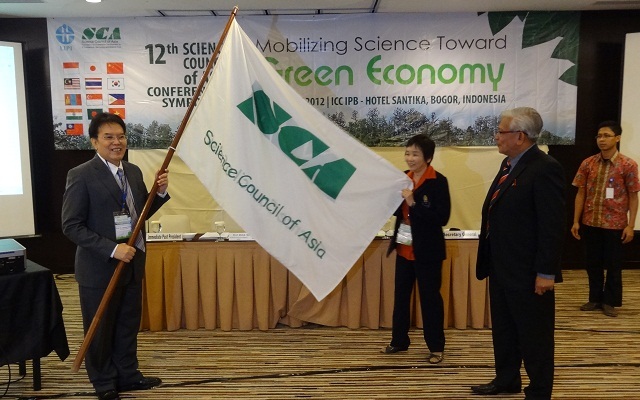 The results of the symposium were gathered into "SCA Declaration on Mobilizing Science toward Green Economy" which was elaborated and adapted at the Management Board on 12 July. At the General Assembly convened on 10 July, applications for new SCA membership from Cambodia, Myanmar, Nepal and Sri Lanka were unanimously approved. The total number of member countries expanded to sixteen. Vietnam Academy of Science and Technology (VAST) became the third member organization from Vietnam, which made the total number of member organizations expand to twenty six. Furthermore, SCA Joint Project Workshops, organized on 10 July, presented three ongoing research projects between Indonesia and Japan, namely "Production of Chemicals and Fuels from Lignocellulosic Biomass (Biorefineries)" by Associate Professor Chiaki Ogino, Kobe University of Japan and Professor Bambang Prasetya, Indonesian Institute of Sciences (LIPI), "Project for Development of Internationally Standardized Microbial Resource Center to Promote Life Science Research and Biotechnology" by Dr. Heddy Julistiono, Indonesian Institute of Sciences (LIPI) and "The Project for Wild Fire and Carbon Management in Peat ? Forest in Indonesia" by Professor Mitsuru Osaki, Hokkaido University of Japan.